SAA’s book publishing program seeks to provide a mix of print and digital resources on a variety of topics that are of consistently high quality, enrich the professional literature, serve the archives profession, and nuture new and veteran voices. Whether you’re interested in submitting a book prospectus or discussing an idea for a module in the series Trends in Archives Practice or being a manuscript reader, SAA offers opportunities to get involved. Since the 1970s, SAA has published more than 150 books. We are committed to providing authors with a superb publishing experience and working collaboratively to insure a superior product. We're not just a publisher, we're a professional association. And you're not just an author, you're a valued member. Together we forward professional discourse. What SAA can offer you as an author . . .
What our authors have to say . 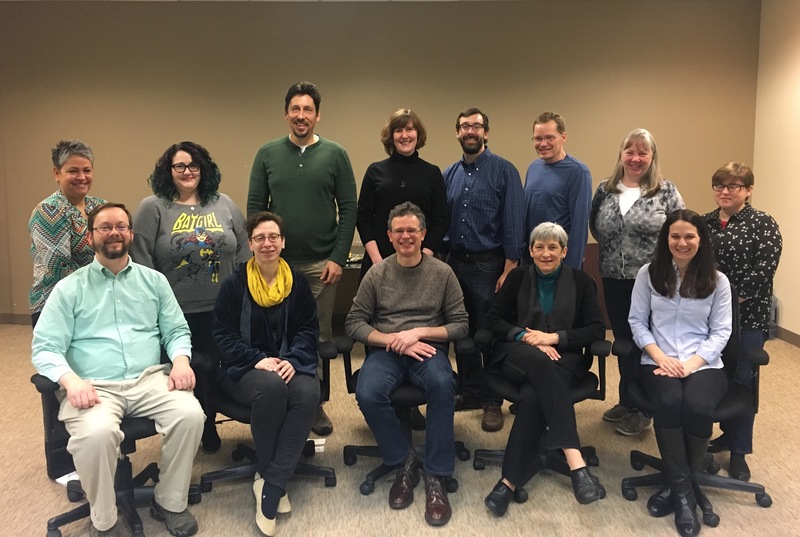 . .
Our intrepid Publications Board is ready to assist you to achieve your publishing goals. Seated, left to right: Aaron Purcell (Virginia Tech), Sarah Demb (Harvard University Archives), Publications Board Chair Christopher J. Prom (University of Illinois Urbana-Champaign), Margery Sly (Temple University), and Nicole Milano (AFS Intercultural Program, Inc.). Standing, left to right: Mary Caldera (Yale University), Jennie Thomas (Rock and Roll Hall of Fame and Museum), Cal Lee (University of North Carolina and Editor of American Archivist), Colleen McFarland Rademaker (Corning Museum of Glass), Michael Shallcross (University of Michigan Bentley Historical Library), J. Gordon Daines (Brigham Young University), Council Liaison Amy Cooper Cary (Marquette University), and Publications Board Intern Jessica Ballard (University of Illinois Urbana-Champaign).